“Hi! I have Amer Heritage Water Walk coming up next week. Do you care to join?” It was Neeraj on the other side. I instantly confirmed my presence. I first met Neeraj in 2015 during Nahargarh Heritage Water Walk being the privileged few to undertake this walk before its launch. Neeraj is a water expert who has graduated from Tufts University & The Fletcher School of Law and Diplomacy, USA and has worked in the US before returning to India to pursue his passion. He runs a water consultancy company and organizes heritage water walks in Jaipur and was instrumental in creating & organizing Jaigarh Fort Water Walk till a few years ago. Amer & Nahargarh Heritage Water Walks were launched simultaneously and I have been wanting to do the former but somehow, it didn’t happen for the last three and half years! In many ways, the Amer Fort Water Walk is special. Why? Let me answer this in the end. It was the last day of January and luckily, the afternoon wasn’t as cold as the last few days with the sun shining brightly. I was waiting in Jaleb Chowk for the rest of the people who had booked the walk. As soon as they arrived, Neeraj introduced everyone & started the walk. He led us all through the Udai Pol towards the Balidan Gate. The briefing & introduction about the walk took on a terrace of the storage tank at level 3. Neeraj explained how the system of carrying water until this point from level 1 to level 3 was different in comparison to level 4 onward. Apparently, Amer Fort relied on two different sources for water. Maota Lake supplied a large volume of water to the fort through a specially designed water transport system. It consisted of various levels each having intermediary storage tanks. Transporting the water relied on age-old simple machinery propelled by both human workforce and domesticated animals. Systems & mechanisms in Amer Fort were influenced by Mughals. Rulers of Amer were generals in the Mughal army and led many conquests from Afghanistan to Bangladesh. It is natural for the Mughal influence and systems to percolate in the Amer Fort. The building that houses the water transport system and storage tanks. While level 1 to 3 is accessible to everyone, entry to level 4 & onward is under lock & key, accessible through this heritage water walk only. Level 4 has a room which used to house men trusted with supplying water to the residential areas of the Amer Fort. Level 5 has a mechanism to transport the water through Rehat – a Persian wheel and a heating system. It is astonishing how incredible these mechanisms were and they served well for years. 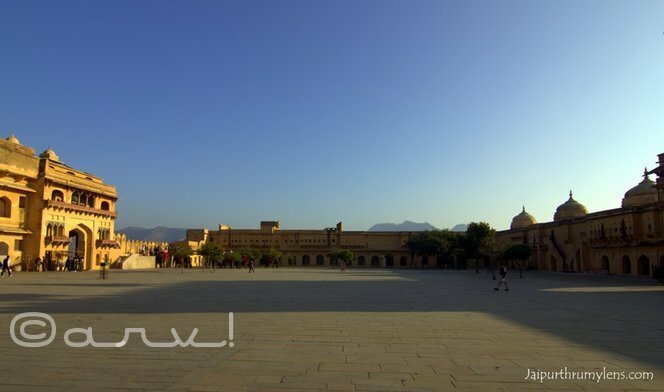 A flight of step took us to the Mansingh Mahal & Zenana area of Amer Fort, the residential quarters of the queens. In no time, we were led into a well through the flight of steps. This underground well under Mansingh Mahal stored a few thousand liters of fresh water collected through the rainwater harvesting system meant for drinking purpose. Surprisingly, the well had lots of water because the system is still functional. 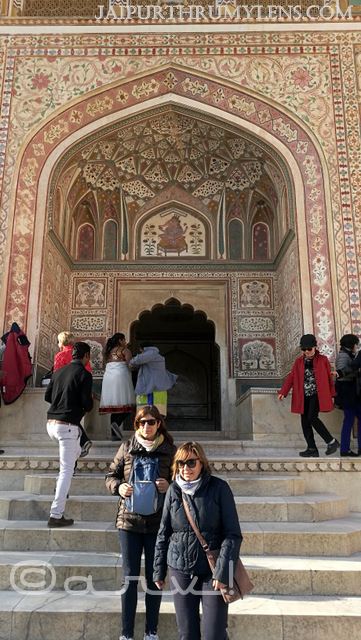 We were crisscrossing from tourist sections like Zenana Mahal & Sukh Mahal to some of the hidden sections of Amer Fort – a water distribution system on the terrace. Two most interesting elements that I saw was an old water pipe made from clay and a water redistribution center. Water channeled into different areas of Amer Fort through a redistribution center. Despite the lack of technology 500-600 years ago, it is spellbinding; it was a sophisticated system that worked on simple principles of physics. If you have ever been to Amer Fort you must have seen the ingenious system of using water to cool hot desert air in Sukh Niwas. It replicates the experience of having an air conditioner. Towards the end of the walk, we entered a secret water chamber having a water reservoir. The large open area was a meeting place used by the royalty during the hot & dry summer months. A fountain provided mist & humidity whereas the lattices cooled the entire hall with the air flow. Despite visiting Amer Fort so many times, I have never seen or heard of this section. It is at a stone-throw distance from the most popular attraction points of Amer Fort – Ganesh Pol, Diwan-e-Aam, and Chhatis Kachari. The Amer Fort Water walk culminated at this point and we walked back to the Jaleb Chowk. I looked up and saw the clouds playing hide and seek with the sun. Amer Fort Heritage Water Walk was interesting because it is unlike the story dispensed by most tourist guides. They narrate the palatial & opulent tales that kings and queens used to live. It is difficult to verify the authenticity of such legends in the absence of written records or information. On the contrary, heritage water walk uncovers the elements that made this life possible and it is based on a scientific investigation. We all know how most civilizations developed and prospered in and around the water sources. The lack of water led to the downfall of many civilizations; while some fled & migrated others perished. Rajasthan being water deficient region pioneered in water conservation & harvesting systems. I have never experienced something similar as a traveler and tourist in any city or settlement, at least in India! World over many regions are headed towards water scarcity; this heritage walk unravels the mindset & outlook of our ancestors towards a scarce resource – water. It paves the way for making life possible in difficult circumstances. This walk allowed me to visit many sections not accessible to the tourists and it is a great way to explore the secrets of Amer Fort. 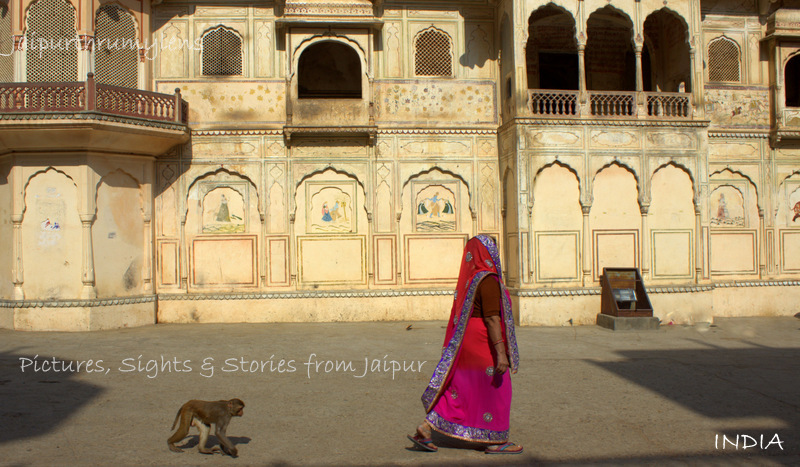 It is a great offbeat thing to do in Jaipur; a hidden gem of the pink city. Here is a short video which explains this water walk. Kindly enable the subtitles since the voice quality is poor. Here are fast facts about Amer Fort and the heritage water walk. Amer Fort is the most popular tourist attraction in Jaipur. It is a palace and former capital of the Jaipur kingdom. It was replaced by Jaipur as a capital in 1727 AD by Maharajah Sawai Jai Singh II. Amer Fort is a UNESCO World Heritage Site and clustered under “Hill Forts of Rajasthan”. Amer Fort Location and Distance? Amer Fort is part of Jaipur municipal limit and is 11 km from the city center. Amer Fort is open from 8 AM to 5.30 PM and 6.30 PM to 9.15 PM. What are Places to visit in Amer Fort? While the top attractions in Amer Fort are elephant ride, Sheesh Mahal, and Ganesh Pol, there are many more interesting things to see. 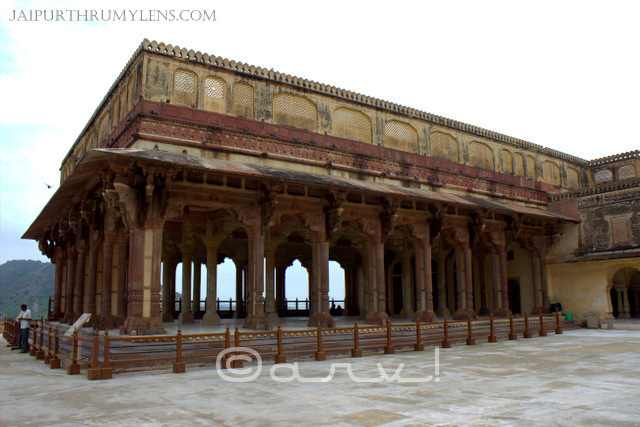 You can read this complete guide on Amer Fort for all these details. How to undertake the Amer Fort Heritage Water Walk? Amer Fort Heritage Water Walk can be undertaken by prior booking only. One cannot buy tickets for the same at Amer Fort ticket window. If you are interested kindly send your contact details via email jaipurthrumylens @gmail.com. What is the duration of the Amer Fort Heritage Water Walk? The walk takes around 1.5-2 hours. Ideally, one should club it with a visit to Amer Fort to save time. What is the difficulty level of the Amer Fort Heritage Water Walk? The water walk can be undertaken by any fit person. It involves walking and taking the flight of steps throughout the fort area. The walk can be modified to suit the groups’ requirement. Good walking shoes, drinking water, camera, notepad, and pen if you like taking notes. The walk is best enjoyed with uninterrupted attention. Mabel, those were different times. Certainly, not the days of plenty and wasteful habits that we are used to. The western lifestyle is like that only. In a stark contrast, the ancient system especially in the eastern cultures it was about frugality. Happy to share this with you, Mabel. How are you doing? Sure, I will. I’m glad you liked the water walk. Did you read Nahargarh Water Walk post too? Previous Previous post: What Makes Rustic By OTH The Most Promising New Cafe In Jaipur?